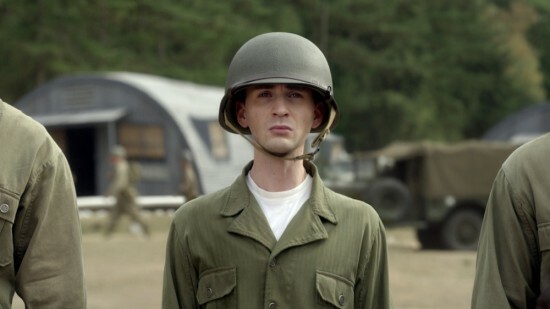 Captain America: The First Avenger is the fifth entry in a new Marvel franchise. Standing alongside Iron Man, The Incredible Hulk, Iron Man 2 and Thor, it works well as a standalone adventure, and serves as a prologue to The Avengers. That's right, kids, Captain America: The First Avenger is the only film you are likely to see this year that has a positive message to say about using performance enhancing drugs. Even though it is not without its flaws, I thought that Captain America: The First Avenger was great fun and I enjoyed it immensely. Like Thor and Iron Man it has the right mix of drama, action and comedy. By far, the film's best asset is Chris Evans. On the page, Captain America is a bit of a bore. Sure, he's a nice enough guy, but Steve Rogers is about as interesting as stamp collecting. He's just so good, heroic and earnest that he is continually overshadowed by his more fun team-mates. Evans manages to brings the character to life, easily overcoming his inherent dullness. Wisely, Evans doesn't do this by turning his Steve Rogers into a Johnny Storm rehash. This is very much the exact same character that Joe Simon and Jack 'King' Kirby created. Evans' Steve Rogers is an innocent, with a naïve charm that makes him an endearing character you want to root for even before he gets super sized. In many ways Evan's performance reminds me a lot of what Christopher Reeve managed to do with the Man of Steel. I honestly can't think of higher praise than that. But as an action film there was very little about Captain America that blew me away. No one moment that made me go 'WOW!'. The action scenes were all just okay and rarely ever jaw-dropping. The film's standout sequence is actually a lively musical number (with music by Alan Menken, no less) that's full of winks and nods to Cap's 40s origins. Much like Matthew Vaughan did with X-Men: First Class, Joe Johnston takes full advantage of his film's period setting. So it's rather strange that, despite being a World War II movie set on the western front, there are hardly any Nazis. Instead, Cap spends the entire movie battling Hydra agents, lead by Hugo Weaving's Red Skull. Weaving is great as Cap's nemesis but the film lets him down by giving him too little to do. And the removal of the Third Reich just seems pointless. 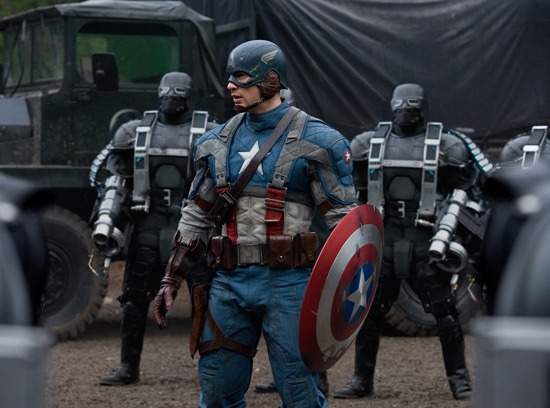 There's nothing really distinctive about the Red Skull's Hydra soldiers (besides the fact they look like gimps). Honestly, I don't see why they couldn't have just been Nazis. If Indiana Jones has taught us anything it is that everyone hates Nazis. — Joss Whedon did an uncredited rewrite of the script in order to better tie it into The Avengers. — Hayley Atwell is amazing as Peggy Carter, while Tommy Lee Jones' entire performance as Colonel Chester Phillips is just him playing Tommy Lee Jones. But I like Tommy Lee Jones and he still gets many of the film's best lines. — The special effects used to turn Evans into a skinny weakling are impressive. I smell an Oscar nomination in the FX team's future. — Be sure to keep an eye out for (in some cases blink and you'll miss 'em) appearances from Richard Armitage, Natalie Dormer, Amanda Righetti, David 'Lord Walder Frey' Bradley and Neal McDonough, who looks so much like Dum Dum Dugan it is kinda spooky. — Naturally, being a Marvel film, Stan Lee has a cameo, despite the fact he had nothing to do with creating Captain America. — Yeah, you did, but not as well as when Rory Williams did it. That was awesome! Three punched out Adolf Hitlers out of four. "only film you are likely to see this year that has a positive message to say about using performance enhancing drugs." LOL!!! I quite enjoyed this film, thought it was A LOT better than Thor! And yeah, Chris Evans' performance as Steve Rogers is pretty much what seals the deal. Also loved the fact that they kept the story a period piece. And as for the lack of Nazis... well isn't Hugo Weaving supposed to be working for the Nazis? Even if he wants to get rid of them all? For the good guys he's just another Nazi mad scientist and needs to be dealt with. In preparation for finally seeing The Avengers on Tuesday, I watched bits of Thor, all of Iron Man 2, and this movie this week. While Captain America was fun, I have to admit I longed for a bit more sarcasm. I know that's not really in keeping with his personality, but maybe Sebastian Stan's character could have gotten a few more quips? Aside from that one quibble, this was lots of fun. I loved the tie-in with Thor's opening scene in the same (unpronounceable and unspellable, to me) town in Norway. I loved the blue energy thing that appears in Thor, Iron-Man 2, and this film. And I loved the utter randomness of Natalie Dormer in a bit part. "Curse of Underwritten Superhero Love Interests" is a large part of why I generally dislike superhero movies. The hero is handsome and heroic and the pretty young thing falls for him without ever having to develop a personality. Annoying. That said, I could Chris Evans up with a spoon. His shoulder to waist ratio is downright ridiculous. He looks like a caricature of a really handsome man. I think that the reason that thre aren't any Nazis in the movie is that it is a weak spot for comic book heroes in general: Where was Superman during the holocaust? And if we're already addressing Captain America The First Avenger, there isn't a single scene in which a concentration camp, or a death camp are shown. It seems that captain America is only interested in saving his soldiers. They were trying to make it appealing to the general public and avoid any hard questions. If you had told me a year ago how into this Marvel universe I would get, I would have laughed at your lunacy. Jokes on me. I will admit that I let out a fangirl squeal of joy during this movie. Not for Chris Evans ( who is admittedly gorgeous), but for Tommy Lee Jones. I have been madly in love with him for years. I adore his snark and his deadpan expression. And, while I agree that he played TLJ, I love when he does so. Hilarious line about performance enhancing drugs. I laughed out loud. Great review, as always, Mark.